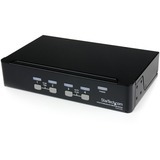 Control 4 systems using a single peripheral set, with dual DVI console connections and multiple picture-in-picture display modes. 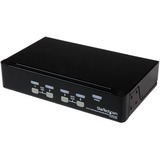 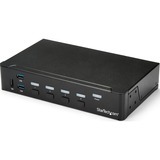 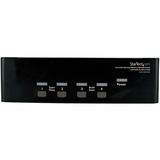 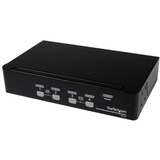 The SV431DVIUAQV 4-Port DVI KVM Switch with Quad-View Display lets you control 4 systems using a single peripheral set, with dual DVI console connections and multiple picture-in-picture display modes. 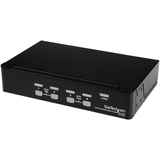 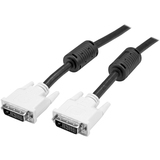 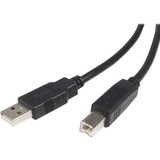 The DVI USB KVM features an integrated 2-port USB 2.0 hub for connecting additional peripherals to share, plus we've included the necessary DVI, USB and audio cables for a ready-to-use solution. 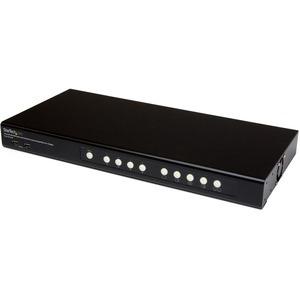 The KVM switch integrates front, push-button controls for simple switching between PCs, choosing your desired display mode and accessing the KVM menu, plus hot-keys and RS-232 command support, for flexible control. 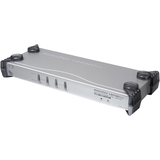 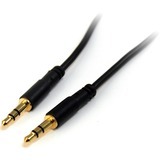 For added versatility, you can daisy-chain up to 8 SV431DVIUAQV units total, for control of up to 32 PCs using a single peripheral set.